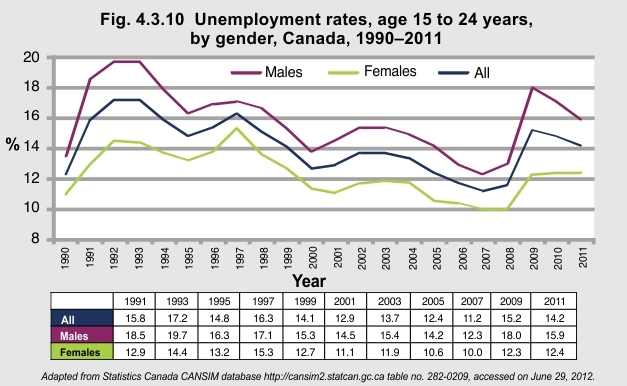 In 2011, the youth unemployment rate in Canada (14.2%) was higher than it was 30 years ago—12.8% in 1981. And, the youth unemployment rate is significantly higher than the national average (14.2% vs. 7.4%). The outlook for employment for youth and young adults has shown some improvement in the last decade, but rates for young males are still high at nearly 16%. 1Marshall K. (2012). “Youth Neither Enrolled Nor Employed.” Statistics Canada. Accessed on June 29, 2012 at http://www.statcan.gc.ca/pub/75-001-x/2012002/article/11675-eng.pdf.